For hundreds of years people have been using steam as a therapeutic way to relieve aches and pains. It’s a luxury that you should give yourself so that you can improve your health and well-being in the privacy of your own home. Let’s take a look at some of the health benefits you can enjoy with the use of a steam shower. 1. Steam showers provide you with relief from stiff joints and aching muscles, either from the ageing process or as a result of a strenuous workout routine. Your body can naturally recover after your exercise time without you having to rely on pharmaceuticals for relief from pain. If you suffer from arthritis, a steam shower can help to ease the pain, reduce swelling, and increase the flow of blood to your joints. It will also help your range of motion if you gently massage and move your joints during the shower. 2. 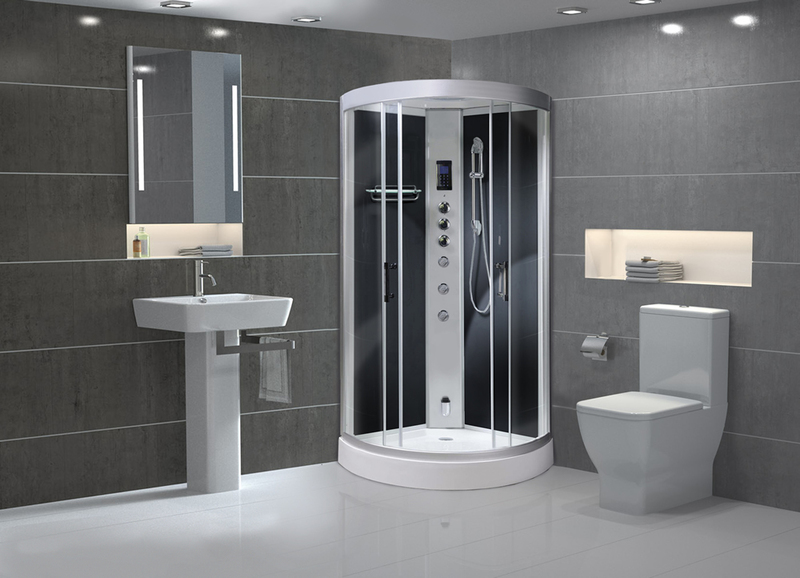 Steam showers such as this one in Carbon Black are also recommended for alleviating asthma symptoms. The steam is beneficial to your lungs and airways and can improve breathing considerably. This wet heat helps relax the airway so that your lungs don’t work as hard as you inhale and exhale. 3. Steam increases the core temperature of your body, and this boosts your immune system, making it even more effective at protecting you from any germs, bacteria or viruses. 4. Spending some quality time in a steam shower also provides you with relaxation that reduces the amount of stress that you may be experiencing. Relaxation produces endorphins that improve your mood and make you feel better. As you know, when you are relaxed and calm you can solve problems and deal with decision-making in a much more effective manner. Stress tends to impact every system and organ of your body, so by relaxing and reducing your stress levels in a steamy shower you are enjoying a natural health benefit that can improve your quality of life. 5. Did you know that steam can also be used to manage your weight? The hot steam increases your blood flow, which impacts your metabolism. The higher your metabolic rate, the more calories you burn. You should combine your steam showers with a healthy diet and lifestyle so that your body will be healthy and your weight loss controlled. If you have a medical condition, be sure to consult your doctor before embarking on any new diet regimen or exercise programme including the use of steam. 6. Taking a steam shower can also be a benefit to any respiratory conditions that you may have. If you have sinus infections or laryngitis, you will enjoy the wet, warm heat of a steam shower. Your lungs, nasal cavity, and lungs will feel relief and you’ll increase the healing that takes place and decrease the time that your infection lasts.